Ben Wikler, Washington director of MoveOn.org, addresses fans of PBS Kids at a rally to save funding across from the Capitol Tuesday. 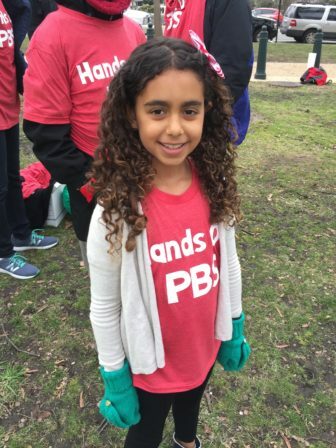 WASHINGTON — Dozens of parents and children gathered across from the Capitol Tuesday morning to protest cuts to public broadcasting’s federal funding that could affect PBS Kids programming. 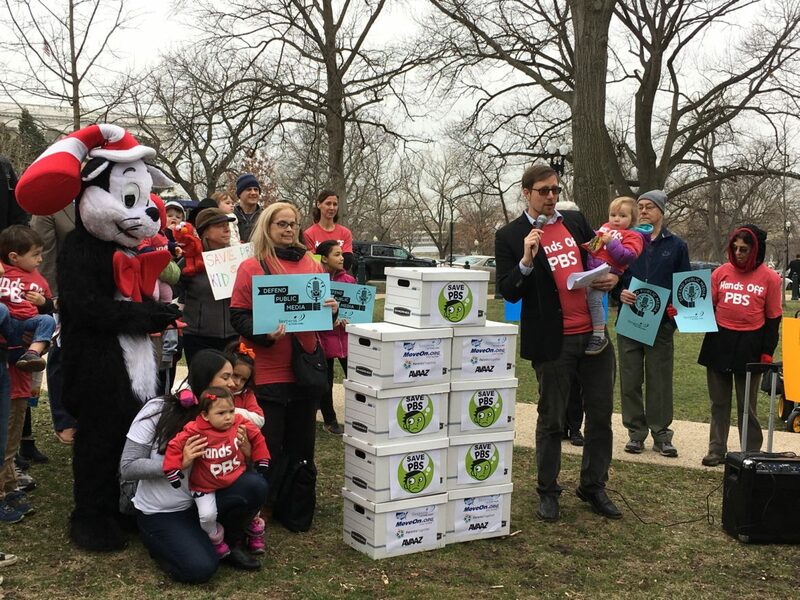 Organizers later delivered petitions to members of Congress, bearing 660,000 signatures gathered online to save CPB funding from being cut by President Trump. His initial budget proposes eliminating funding for the corporation. Kids wearing pink “HANDS OFF PBS” T-shirts waved little American flags as organizers — several with their own children in tow — took to a microphone beside boxes that symbolically carried reams of petitions. “Kids can’t vote, so they need us to step up,” Aaron said. “Congress needs to make the right decision and keep PBS,” Iman said. But not everyone in the crowd wanted snacks and face painting. 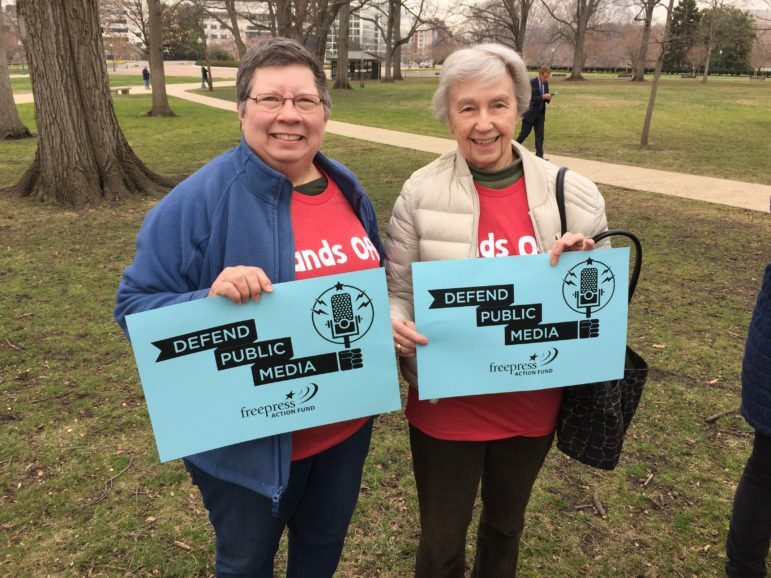 Older fans supporting the larger goals of public media showed their support as well. Trump’s final budget is expected later this spring. The document will then go to Congress for revisions and approval. Here’s our Facebook Live stream from the event. Facebook Live video shot by Current Associate Editor April Simpson. Last year’s letter was signed by a bipartisan group of 132 members of the House. Good idea!!! Also my nephew Gabriel grews up with George. 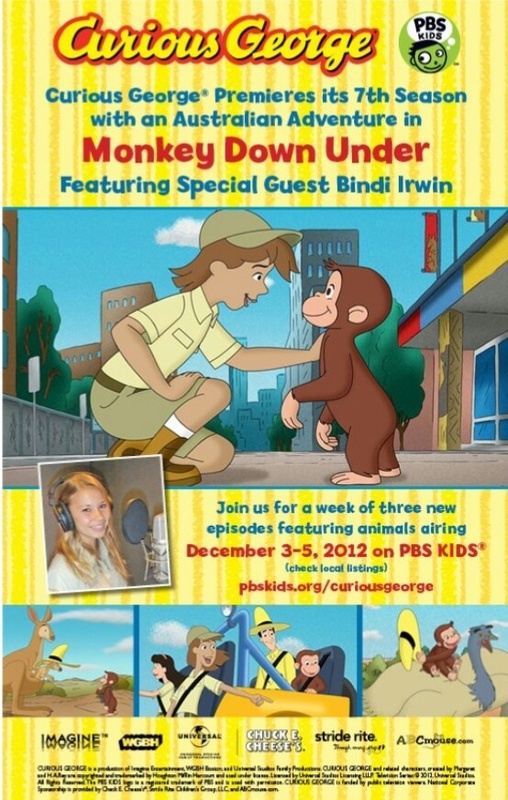 This curious monkey will be interesting. Keep on with our toddlers and big kiddies!!! https://uploads.disquscdn.com/images/6789d77c57e8086820d02273ed5cf0a3d5b20860e13342baca22624f5c47b375.jpg Even the daughter of the legendary Croc Hunter voiced as herself on a cartoon character on the season 7 of this ‘GBH co-production with Universal.